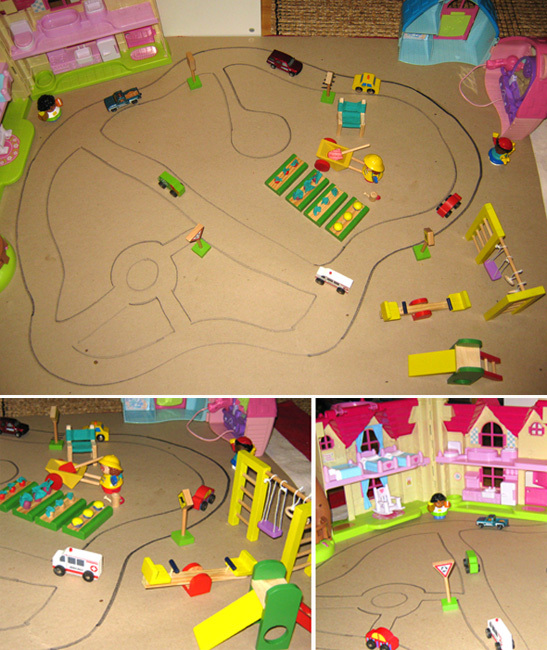 Adding a simple roadscape hand drawn on a large piece of cardboard has brought together a number of our imaginative play elements – small houses and people figurines, a wooden park and market garden, road signs and vehicles. I know it is simple and not flash (and I could easily add more details with some coloured felt tipped pens – maybe tomorrow!) but it provides a wonderful platform for extended play scenarios. As well as the regular daily occurrences of a dollhouse family, Immy has created storylines involving trips to the vet in an ambulance for a wayward kangaroo (we have a beware of kangaroos crossing sign), harvesting vegetables for dinner and for sale in a store, adventures on the way to school, and on trips to the park. if there is a link back to childhood101.com within your post. If you are reading this via email or RSS feed, you will need to visit the post to see the play idea links or add your own. I love your small world play - so neat that you have all the pieces ready for this play! Great idea :) We've been making some fun houses for my daughter's fairy and princess dolls -- out of cardboard boxes that we're reusing. I used some scrap booking paper to add some pazazz and it's been a lot of fun decorating them and playing with them. I love how much fun simple things can be! They sound lovely, Heather. Taking a little time to make something look special can really extend a child's enjoyment and play experience I find. I love the idea of drawing it. I find by the time we've built the train tracks they don't want to play with any other elements, drawing it is much quicker and lets the other parts shine. I love the idea of doing this with chalk outside. What a twist for outdoor dollhouse play! Thanks for sharing! Your Playful Community looks awesome... I see that the play set made it by Easter....! Looks like Immy will be having lots of fun with this!